BPID Clear Vinyl Horizontal Badge Holder with Slot and Chain Holes, 3.3" x 2.5"
Home | Facility Safety | Brady People ID | Brady People ID Badge Holders | BPID Clear Vinyl Horizontal Badge Holder with Slot and Chain Holes, 3.3" x 2.5"
100/PKG Horizontal badge holder keeps your valuable, high-tech proximity card safe, clean and secure. Badge holder can be locked in place by threading a strap clip or neck chain adapter through both sides. Clear vinyl offers durability and clarity to easily view your proximity card. 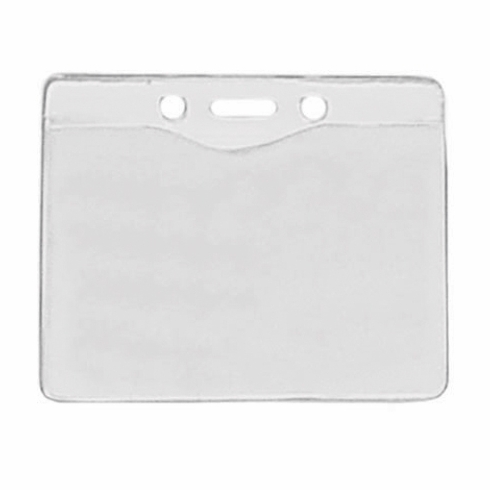 These clear vinyl badge holders feature slot and chain holes for easy attachment.